We started a weather unit a few weeks ago in our first grade classroom for science, which happened to probably be the best time! Right now, we here in Tanzania are going through the transition from "crazy, inescapable hot and dry" to the rainy season. It started raining a couple weeks ago, and has done so off and on!! I'm so looking forward to cooler weather and less dust! Anywho, we are able to track our weather, look for the different types of clouds, and have great examples of weather! Right now, our class is in the clouds! 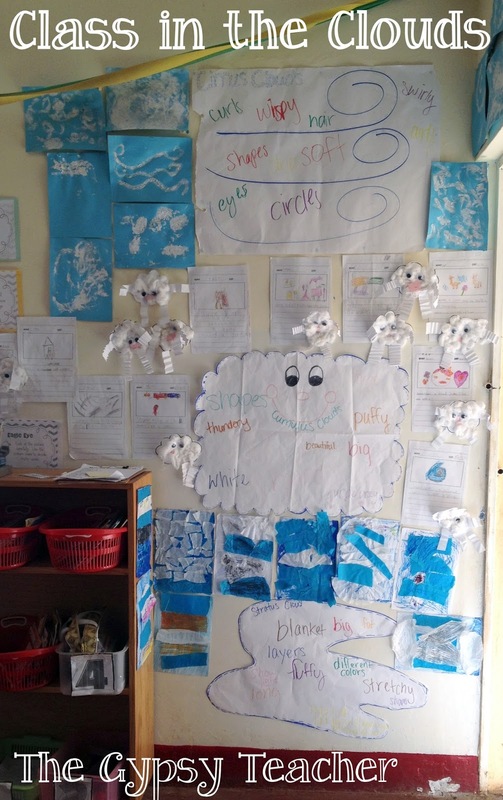 We discussed, looked for, created, and wrote about Cumulus, Stratus, and Cirrus clouds these past few weeks, ending in a fun experiment and creating a cloud wall! Before we jump in, a lot of these ideas come from Kristen's blog, A Day in First Grade, and weather unit!! 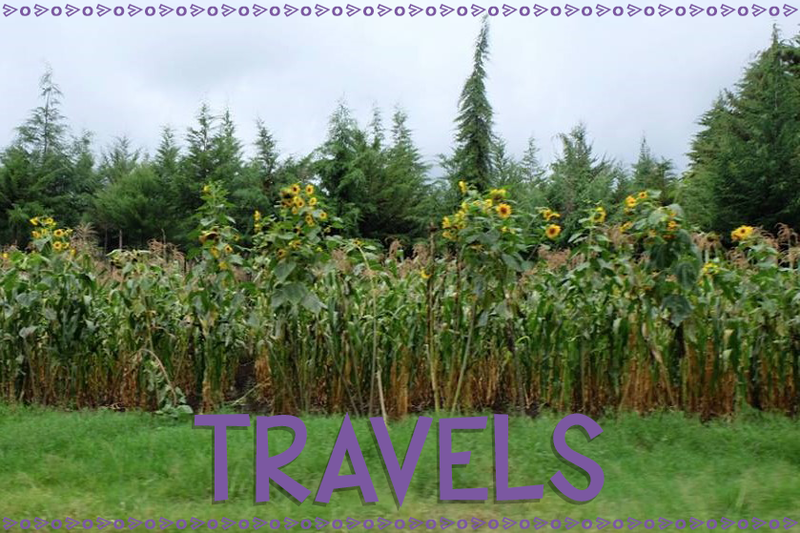 I seriously love Kristin's blog; it's one of the first ones I go to for ideas. 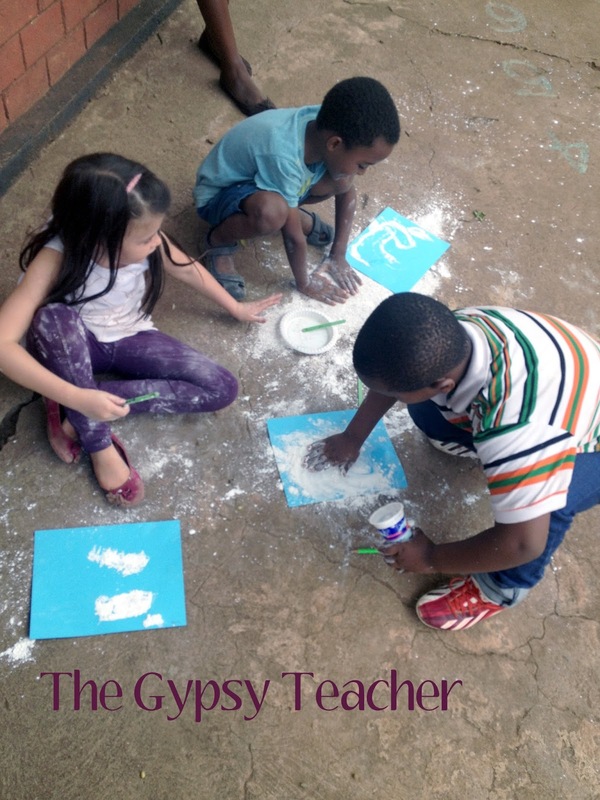 My students LOVE her experiments and activities, and so do I! 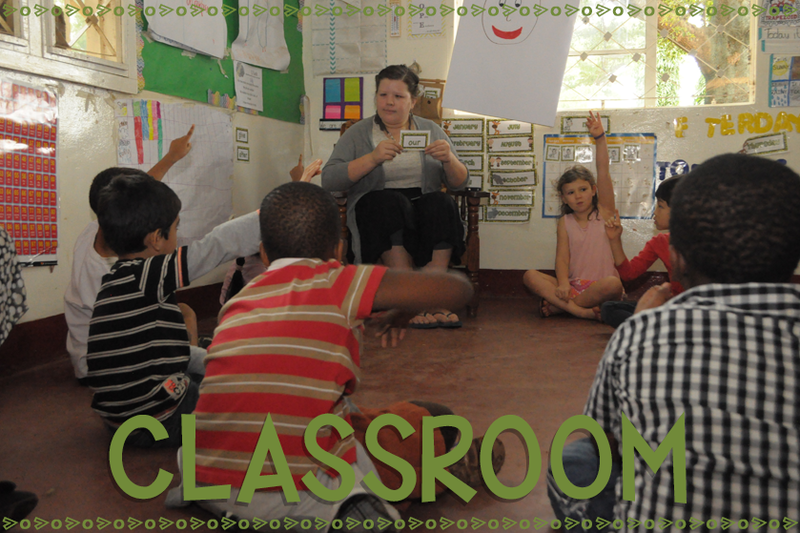 So, if you're a kinder or first grade teacher, go check it out!! We started off our Cumulus Cloud lesson outside. We headed out to the playground and looked in the sky to see shapes in the cumulus clouds! 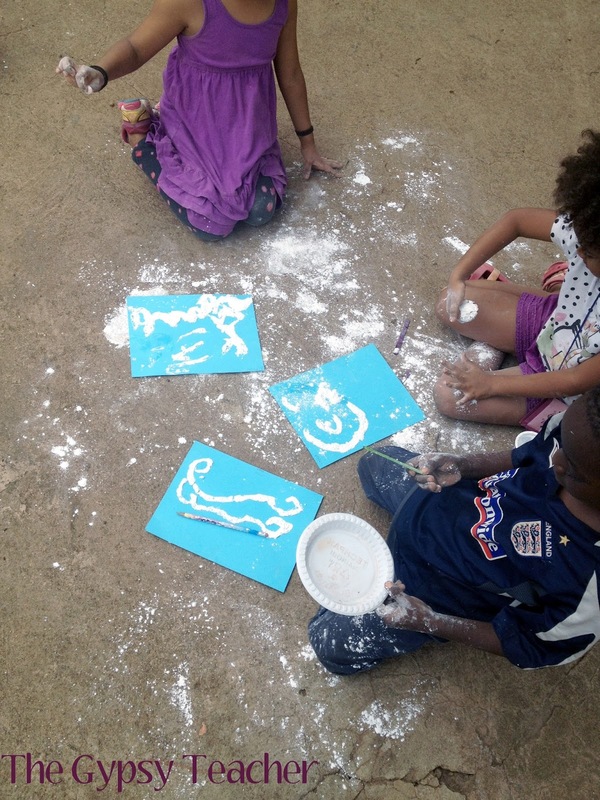 There have been a lot of cumulus clouds in the sky lately, so they had fun seeing what they could find, Some things we saw included: a crocodile, a spiral, and a bat. Then, we went inside to make an anchor chart for our cumulus clouds. I used Kristen's idea, to make it in the shape of a puffy cumulus cloud! We thought of words to describe these clouds and wrote them on it. We learned that they come out when the weather is nice and they stay low in the sky compared to cirrus clouds. 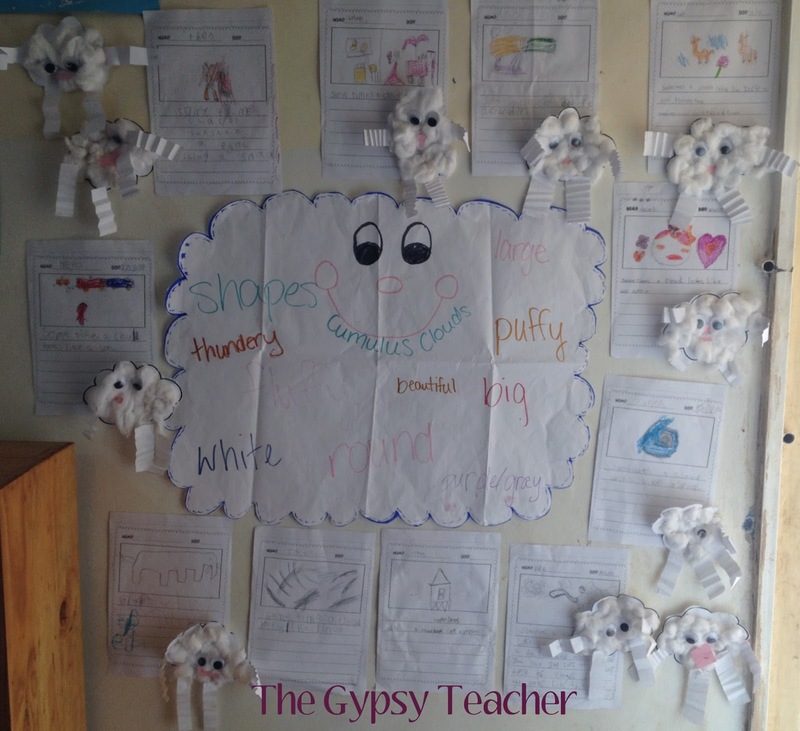 We talked about how they look like a heap of cotton balls, which is why their name means pile or heap. 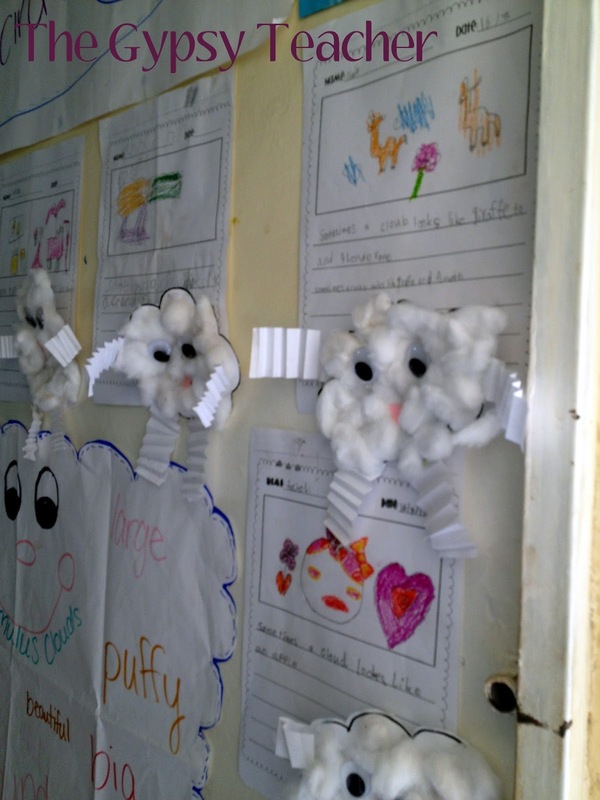 The next day, we made these cute "Cloud Critters" and wrote, "Sometimes a cloud looks like _____________" and filled in the blank with something we had seen yesterday, or some time before. The cloud critters were super easy! I found an outline template of a cloud online and printed one out for each student. They cut them out, glued on some cotton balls, googly eyes, and mouths. I also cut some white strips of paper for their arms and legs, and they folded them like a fan and then stretched them out. My inspiration came from Fun 2B in First! We also watched the cute Pixar video called "Partly Cloudy". It's not educational, but the kids loved it! Sometimes we need a little fun in there too to make it stick!! I did preface it with a little "This is not real; it's just a funny fictional video" talk, just in case. Then, we moved on to Cirrus Clouds! With each cloud type, we not only looked outside to find the clouds, but I also pulled up a Google image search with each on my laptop so we can see different examples of the clouds. 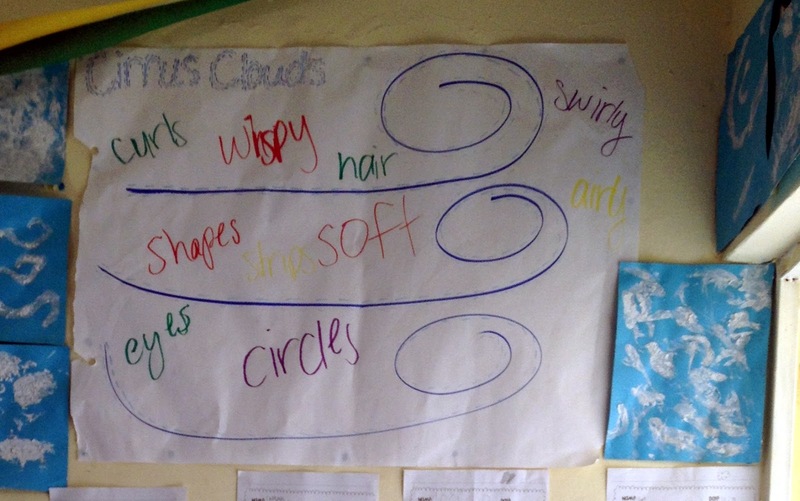 So I did this for our cirrus clouds, and we thought of words to describe these clouds, and wrote them on the anchor chart. 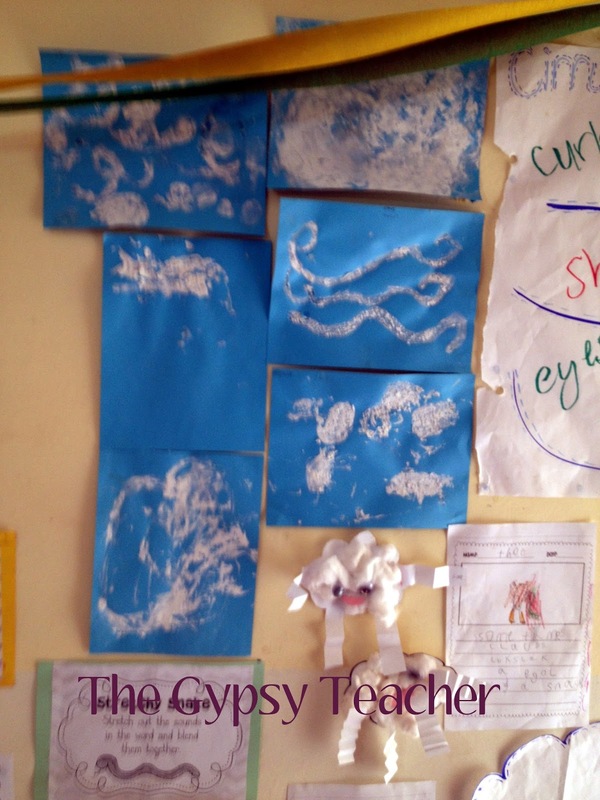 After discussing these wispy clouds, we did our craft the next day! Kristen suggested painting the clouds with white paint on blue paper. But, my students were on "paint probation" at that time, as they went crazy with our last painting project. Also, paint is a hot commodity here, so I thought it would be best to save what we have. So, I was trying to think outside of the box. I came up with the idea to "paint" glue with Popsicle sticks on the blue paper and then sprinkle cornstarch on the glue for it to stick, since cornstarch can make that soft, wispy look. Maybe not the best idea, but, hey, it worked! 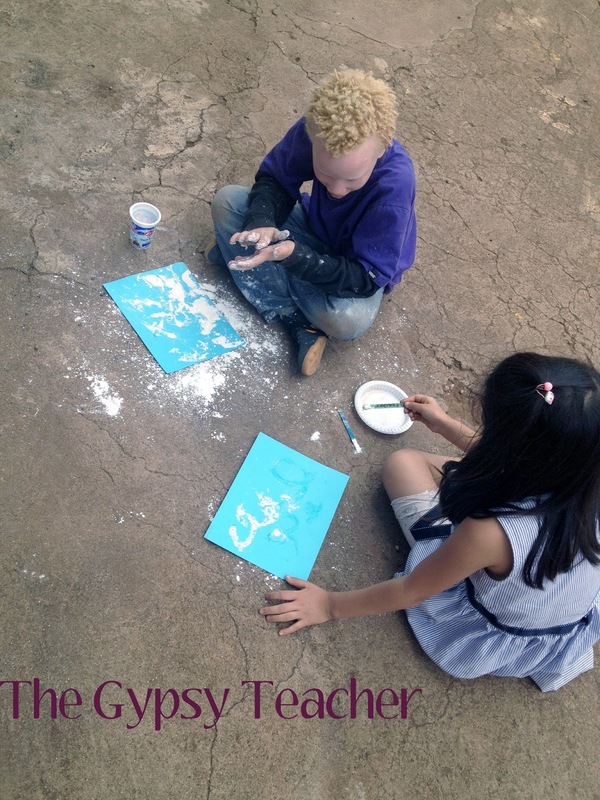 It's definitely a messy craft, so we did it outside on the concrete. Some were very precise on where they put the glue. Others enjoyed spreading it all around for a different effect. It's a messy, but fun, craft with different textures! Here are some of the final products! I think they look like great cirrus clouds! Lastly, we explored Stratus Clouds. These are the low clouds that look like a blanket. We discussed how they like to hang around mountains (like the mountain in our "backyard": Mount Kilimanjaro) and oceans. They are the ones that cover at night to keep the heat locked in, since the sun isn't shining to give us heat. For this craft, we used Kristen's idea. We drew a blue background to be the sky on a piece of white cardstock. 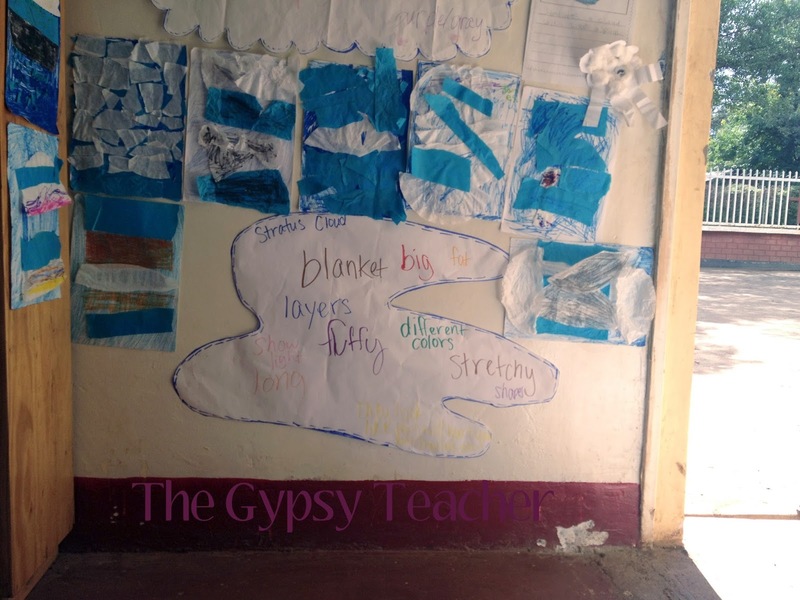 Then, we ripped pieces of tissue paper, scrunched them, and glued them in layers to our backgrounds. If you are teaching about weather, I definitely recommend that you check out Kristen's Youtube video playlist on weather! 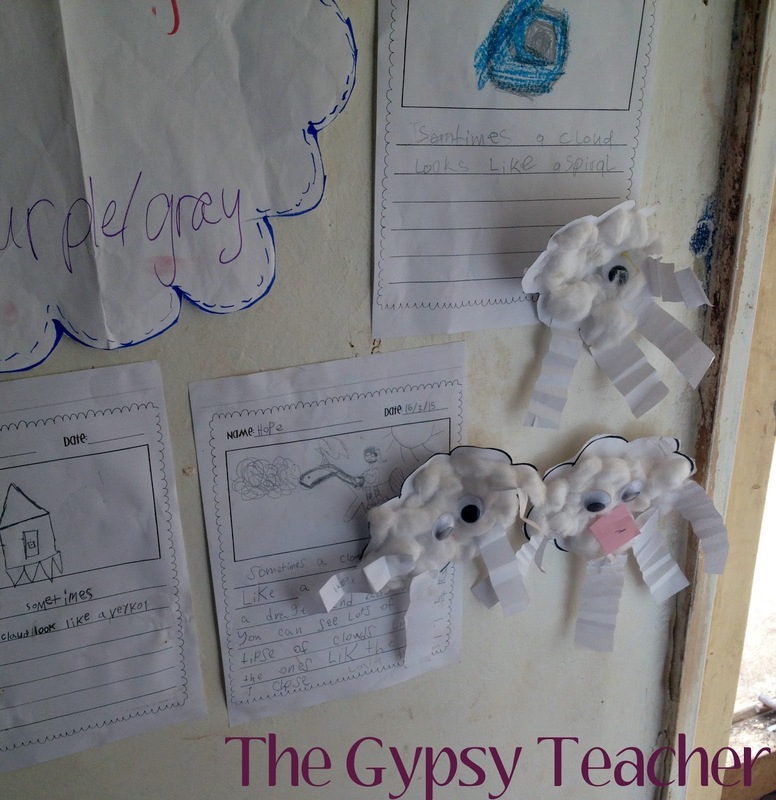 I was going to include our fun Cloud in a Jar experiment in this post, but I think I'll save that for next time and put it with another science experiment we did! Make sure you check back next Friday for that post! 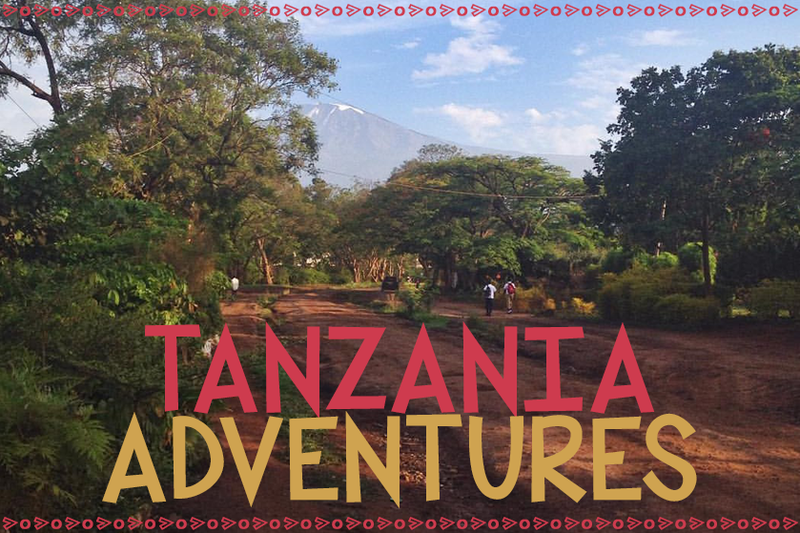 I've decided to TRY my best to post twice a week- Tuesdays will be some sort of a "Living in Tanzania" theme and Fridays will be dedicated to teaching- ideas, lessons, recaps, etc. We shall see how it goes!! I'm proud to say all of these projects done in this post are "overseas approved", meaning that you don't have to be living in the U.S. to do them (which is a huge bonus for me)!